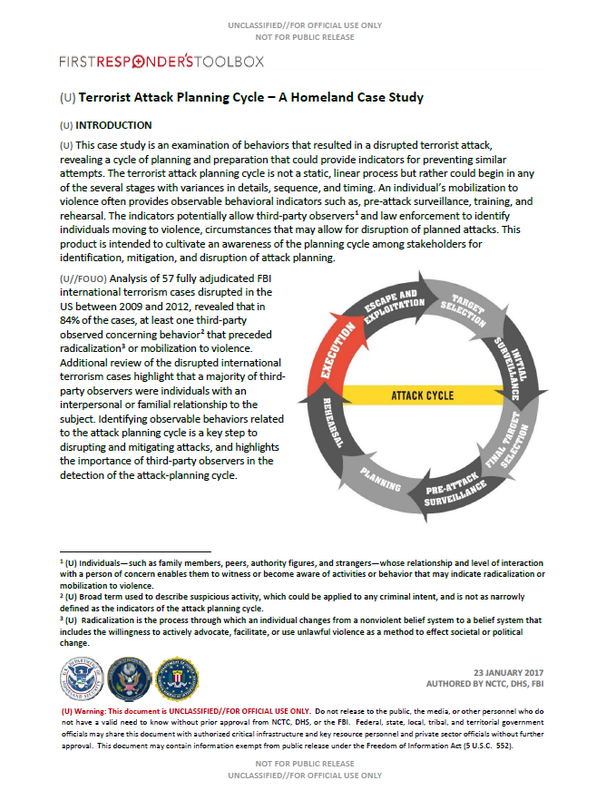 (U) This case study is an examination of behaviors that resulted in a disrupted terrorist attack, revealing a cycle of planning and preparation that could provide indicators for preventing similar attempts. The terrorist attack planning cycle is not a static, linear process but rather could begin in any of the several stages with variances in details, sequence, and timing. An individual’s mobilization to violence often provides observable behavioral indicators such as, pre-attack surveillance, training, and rehearsal. The indicators potentially allow third-party observers and law enforcement to identify individuals moving to violence, circumstances that may allow for disruption of planned attacks. This product is intended to cultivate an awareness of the planning cycle among stakeholders for identification, mitigation, and disruption of attack planning. (U//FOUO) Analysis of 57 fully adjudicated FBI international terrorism cases disrupted in the US between 2009 and 2012, revealed that in 84% of the cases, at least one third-party observed concerning behavior that preceded radicalization or mobilization to violence. Additional review of the disrupted international terrorism cases highlight that a majority of third-party observers were individuals with an interpersonal or familial relationship to the subject. Identifying observable behaviors related to the attack planning cycle is a key step to disrupting and mitigating attacks, and highlights the importance of third-party observers in the detection of the attack-planning cycle. (U) Law enforcement became aware of John T. Booker Jr., a 20-year-old US citizen from Topeka, Kansas, through a citizen complaint. In April 2015, Booker was indicted on one count of attempting to use a weapon of mass destruction (explosives), one count of attempting to damage property by means of an explosive, and one count of attempting to provide material support to the Islamic State of Iraq and the Levant (ISIL). This case is an example of a homegrown violent extremist inspired by overseas terrorist groups who exhibited several observable behaviors of the attack-planning cycle that indicated radicalization and mobilization toward violence. (U) In February 2014, Booker was recruited by the US Army in Kansas City, Missouri, and was scheduled to report for basic training in April 2014. On 15 March 2014, Booker publicly posted on a social media website his intent to “wage jihad” and desire to martyr himself. On 19 March 2014, he reiterated his desire for martyrdom on the social media site by indicating end-of-life preparations, a behavior suggestive of the execution stage of the attack-planning cycle, reportedly observed by third-parties. (U) On 20 March 2014, Booker was interviewed by the FBI whereby he admitted his intent to commit an insider attack against American soldiers like Nidal HasanUSPER at Fort Hood, Texas. Booker stated that he had formulated several plans, which included firing at other soldiers while at the firing range during basic training or during pre-deployment at a military base. Finally, in November 2014, Booker expressed to an associate his desire to join ISIL, showed an online video about suicide bombers and martyrs, and stated that he had wanted to die a martyr since the first time he watched the video.